Insulation applied to the attic is a key way that you can keep your home warm in the winter and cool in the Tennessee summers. By properly sealing and providing roof insulation, roofing contractors can bring homeowners greater comfort and financial savings. Heating and cooling systems can function far more effectively and efficiently when attics are insulated, so you can recoup the cost of your home insulation project over time. Count on the team at Burell Built Exteriors to correctly install and plan for roof insulation for your Knoxville, TN or Chattanooga, TN area home! 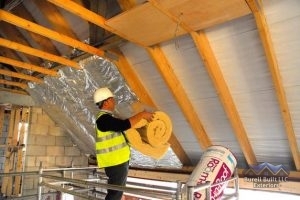 In the process of insulating a home, we first ensure that any air leaks in the attic or roof are fully sealed to avoid air flow through or around the insulation material. This ensures optimal performance of the insulation chosen, and also means that you’re getting the full R-value that you’re paying for. R-value refers to the ability to resist heat flow, which is how the performance of insulation is measured. Higher R-values means more insulating power. Our highly-trained team will recommend the right material and R-value for your home, taking into consideration the layout and local climate. Material-wise, we work with fiberglass (both batt and loose blow-in), cellulose, rigid foam board, and radiant barrier for roof insulation. We generally recommend using blown-in fiberglass over cellulose. This material is preferable to us because there is nothing in it that can burn, there is minimal settling, and it doesn’t break down over the years. For you, this means that you’re actually going to realize the benefits of your insulation investment for years to come. 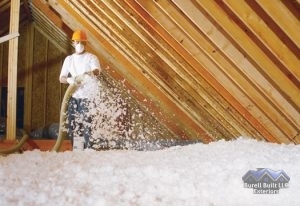 Existing homes can reduce the energy bill by as much as 30% by adding fiberglass blown-in insulation to an R-49 level. You can learn more at EnergyStar.gov, or call us today for a roof insulation consultation! Even the best insulation materials out there won’t do much to provide home comfort and efficiency if they aren’t installed the right way. You may think that you’re paying for a great R-value and expect to see savings, only to find yourself still warm during the summer or freezing during the winter. Installation is the key here. Choose the right team of experts and give yourself the peace of mind that you’re truly making the most of your investment. Team Burell Built stands behind our work, and because we understand well the complexities of home roofing, we won’t cut corners. Trust our team of professionals for your roof insulation project on your Knoxville, TN or Chattanooga, TN home! Call us today for a quote. Updated on September 16, 2016 at 2:21 pm by Burell Built Exteriors.